1. 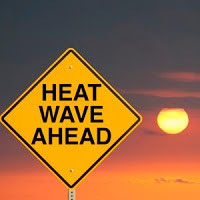 The Heat Wave eases in the Eastern States of Odisha and W.Bengal. Clouds appear, and the day temperatures start dropping by 3/4c. Bhubaneshwar becomes cloudy, and can expect a thunder shower on Wednesday. Kolkata also gets cloudy, with traces of rain on Monday and Tuesday in parts. Wednesday the city can expect a 15-20 mms thunder shower. Mumbai: Partly cloudy and hazy sun. Nights will be less cool. Temperatures between 32c and 21c. Pune: A heat alert for Pune as we can expect the mercury to touch 37c or maybe 38c on Tuesday. Srinagar: Sharp drop in minimum temperatures from Monday morning. Delhi NCR: Sunny days, with temperatures touching 30c by Tuesday. Indore: Warming upto 34/35c by Wednesday. Saurashtra (Junagadh, Rajkot): After a warm Monday /Tuesday, around 33/34c, the day can touch 35c on Wednesday. I'd be interested in Chandigarh. Kartik: Chandigarh will be clear and dry. next few days will see gradual heating up, and touching 30c by Wednesday. Sir, what is the reason that Pune is so hot so early in the season? Jabalpur will be partly cloudy and warm. Temperatures gradually rising to 34c by Wednesday. Nights around 16c. Bilaspur will be warmer at around 35c, but could expect a shower on Wednesday.Low around 18/19c. Arjun: I feel Pune can get hot to an extent as it is on the edge of an upper air trough. This could create some cloudiness and stuffiness. Winds will change to S/SE. Amit: Rain could be Wednesday or a day earlier. Badlapur(private reading) max temp 33.8°C with just 6% single digit humidity today (which is desert like dryness) !! So record can be say in terms of less max temp with such low humidity is abnormal !! As in March max 37-38c with 6-10% humidity is common as deep blue sky and high temps with land breeze make it dry.. But today it is such low humidity when max temp is under 34c !! In that today it is alto cumulus cloudy cover so shadow falling and NW breezy so not deep blue sky also even then such low humidity !! Mumbai Scruz max temp 33.2c with sure around very low 10-12% humidity today !! As Mumbai Scruz 30.4c with 20% humidity @ 11.30am & then 31.6c with just 19% humidity @ 2.30pm with 15km/h NW winds blowing but still just 19% humidity !! So surely 10-12% would be minimum humidity around 1pm!! Also at 5.30pm, Scruz 29.4c with just 21% humidity.. So there also even of coastal city + NW breezy + alto cloudy + lower max temp (means below 36-37c) has kept humidity very low !! I'm surprised to read about low humidity for a coastal city...being in Chennai always 70% above in 90 percent of days except in late may and June when humidity is 50% during day..Mumbai is very special indeed..
On Monday 22nd, Pune Max 36.7c and Airport 37.8c. Sites like IMD, skymet and accuweather are predicting rain for pune by the end of this month. Your take ? Rajesh sir,would you see rain in pen roha andvmumbai in next days?